The excitement leading up to the opening of Tupelo Honey Cafe in South End took on a life of its own on social media and in the local press. One would have thought renowned restaurateur Danny Meyer or chef Thomas Keller were setting up shop. After opening last December, the ensuing popularity has caused the parking lot to be crowded, lines to form at certain times, and a lot of head-scratching among area food aficionados like myself. A Southern cuisine restaurant is a strange hybrid of forms. It is for the tourist and transplant, but about the resident. It is predictable, but emotional. It gestures simultaneously to the past, the present and the future. Or it should. 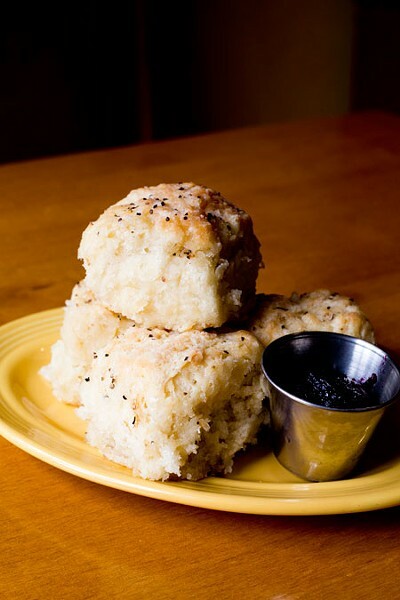 When Tupelo Honey Cafe opened in downtown Asheville in 2000, good restaurants could be counted on one hand, and tourists visiting that charming mountain town were curious to explore Southern cuisine. In 2008, Tupelo was sold to Steve Frabitore, who now has a chain of six stores in three states. The 225-seat, 7,100-square-foot Charlotte store opened in December in the space formerly occupied by The Pewter Rose. The interior has been refreshed, but the brick walls and early morning cheeriness remain. Tupelo's menu, a predictable round-up of aging Southern all-stars, is overseen by executive chef Brian Sonoskus, who has been with Tupelo Honey in the Asheville location since 2001. Fried green tomatoes? Check. Fried chicken? Of course. Pimento cheese, catfish, crab cakes, biscuits, sweet potato fries, sweet potato pancakes ... well, you get the picture. The menu at all six locations is the same. Tupelo's kitchen offers items that used to define Southern cuisine, before chefs like Charleston's Sean Brock got a hold of it and returned this cuisine to its legendary roots: great food fresh from the field, orchard and stream — a food that had its own language and did not require the fryer or the sugar bowl. But if you like Buddy the Elf's approach to food — "the four main food groups: candy, candy canes, candy corn and syrup" — Tupelo Honey Cafe might be your kind of place. Sweet and salty are the dominant flavors. And judging from the crowds of people willing to queue, owner Frabitore knows what people want and the menu-speak accurately portrays each dish. Even cocktails like Blueberry Field Forever are more jammy than complex. You can distract yourself by knocking back tall glasses of the blueberry punch mixed with apple cider, pineapple juice and ginger ale. A short round-up of bottled brews is offered with an even shorter and more random, primarily West Coast, wine list. On the starter list, the pimento cheese dip is more laid-back than opinionated, while the fried green tomatoes are fettered by a heavy, salty coating. Entrées arrive in hearty portions. The beef meatloaf with its juxtaposition of textures trumps its comparatively wan side of mac and cheese. The opulent shrimp and grits pack a bit more punch, with goat cheese opening up the grits and cayenne adding a kick to the red pepper sauce. Tupelo's desserts are perfectly in line with the menu. That list includes a pecan pie and a rich and creamy banana pudding. Yet, an eatery named for a food product should offer that food product, right? After all, Phat Burrito sells burritos, and Bang Bang Burgers sells burgers. So Tupelo Honey Cafe should offer Tupelo honey, the gold standard of American honeys. As honeys go, the quite expensive Tupelo has as distinctive a flavor profile as a New Zealand sauvignon blanc and is quintessentially Southern. The largest concentration of the white tupelo tree grows along rivers and swamps in a narrow swath of southern Georgia and northern Florida and the nectar of its fruit, the Ogeechee lime, is what bees use to make this monofloral honey. But on my visit, the honey served at Tupelo Honey Cafe was not Tupelo honey. Rather, the honey served in a squeeze bottle with the fluffy complimentary biscuit is generic and bland. "That was a disappointment," my dining companion muttered as we pushed through the crowd on the way out.